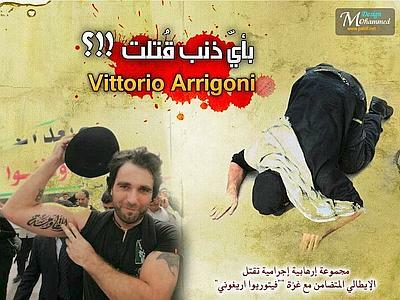 We don’t know for sure as of yet who murdered international Italian activist Vittorio Arrigoni. However, whoever committed this despicable crime must be a human beast walking on two legs. Vittorio Arrigoni was abducted on Thursday, 14 April, in Central Gaza. Members of a notoriously fanatical group posted a video online saying they would kill him unless the Gaza government released detained Salafists from prison. Within a few hours of the warning, Arrigoni’s body was found in an empty house. The accused group, the Tawhid and Jihad, has denied posting the video or any involvement in the killing of Arrigoni. They hinted that the Israeli intelligence may have been the real killers of the Italian activist. And while Israel can never be ruled out as an accused party, it is widely believed that the so-called Salafi group (Salafi means a true follower of the Prophet) remains the premier suspect. They are guilty until proven innocent, given the prima facie evidence that would indict them. It is true that the Salafis are not carbon copies of each other. However, the militant Salafis have been accused of abductions, killings, attacking internet cafes, and calling for the expulsion of Christians from the Gaza Strip. A group of Salafis last year carried out an armed rebellion against the Hamas-led government during which several people lost their lives. In one episode, an intermediary who was carrying a message to their leaders was brutally murdered by those who called themselves Muslims. Islam is absolutely against killing messengers even in war time. One would hope to give these stupid fanatics the benefit of the doubt. However, their diabolic crimes in many parts of the Muslim world leave us no doubt as to their true nature. They claim they are out to fight the armies of the disbelievers who have invaded some Muslim countries. However, the falsehood and mendacity of their claims are made clear by the fact that for every western soldier they killed, they murdered at least a hundred Muslim men, women, and children. And when they are confronted with these crimes, they often seek vague, erroneous, spurious and invalid edicts to justify and rationalize what is obviously evil. Islam is not a vague religion, especially when it comes to human life. However, these ignorant fanatics seem to have been blinded by their misplaced zeal and ignorance. They thrive and prosper and become quite gleeful upon killing innocent people, whether Muslims or non-Muslims. And they think that by so doing they endear themselves to the Almighty when the opposite is true. Have the killers asked themselves what in the world would justify killing Arrigoni, a man who came all the way from Italy to identify with the Palestinian struggle for freedom and justice? What wrong did he do? What crime did he commit? Didn’t they realize that Arrigoni may have done so much for Gaza which has now been besmirched by their cowardly crime? Arrigoni didn’t come to Gaza as an aggressor or invader. He came to show solidarity with its wronged people and highlight the immense oppression meted out to be people by the Nazis of our time, the Zionist Israelis. Hence, the claim that he came to the Land of Islam to spread corruption and disbelief should be treated with the utter contempt it deserves. Re: ARRIGONI EXECUTION/ WRITE TO ITALIAN FOREIGN OFFICE TO CLOSE KAPLAN SITE! SCRIVETE ALLA FARNESINA ! !